3 x 1080p LCDs running of Nvidia GTX750Ti in AKiTiO on my mid-2014 15" Retina MBP Iris Pro. Awesome work! Sadly I don't have a Thunderbolt Mac, but if I had I wouldn't hesitate to get an Akitio box and buy your tool. I'll definitely keep an I on your work, maybe I'll replace my Hackintosh with an MBP + eGPU some time. It's an incredible advance for eGPU on Macs with TB2. Netkas was fiddling with eGPUs back in 2011, now he continues with this groundbreaking discovery. All the latest and best eGPU info will be coming from this site. If only we could change default renderer from iGPU to eGPU with some hacks. Place that on my desktop. Bring my MacBook Pro (Retina, 15-inch, late 2013) and it will drive the display I have connected to the AKiTio box? How is the performance? I see you write OS X, would it be able to work in bootcamp? With Windows 10 or something? You will need to provide power for the GPU. You will also need to do some kext mods for OSX. I will be posting either instructions or a link. Windows has become the easy part. You just need to be using a GPT install of Windows, not MBR. I actually don't have that much programming knowledge, but I think it might be possible to implement such an selection-box like found in GL view using the SIMBL applicacion extension plugin. Somebody having some programming skills could try. Implementing something like this to the windowserver process might even work systemwide. Is this still necessary if you use automate-eGPUhttps://github.com/goalque/automate-eGPU? Or does automate-eGPU take care of that? Old goalque's "remarkable discovery" came less then 24 hours after he took a look under the hood of one of Netkas' customers. As in he "discovered" how Netkas did it and copied his work. Couldn't hack his way out of a wet paper sack. Some of you may have noticed that I’ve put a warning text at GitHub. For most of us, it’s not hard to guess who I’m talking about. As he persistently continues insulting me of my volunteering work, he deserves now more public attention here as well. His answer to previous and a couple of earlier statements such as “glory hog goalie at techinfernal” were pruned off in MR forum. Letter replacing technique didn’t work. I’ll never go to that level of discussion what MVC wants to keep up. The Mavericks comparison method is still repeatable, the ioreg command doesn’t lie. Said earlier, but I want to mention again that Pike R. Alpha originally figured out the black screen issue with the Mac Pro 6,1. He didn’t use eGPU. However, it’s exactly the same “none” method (described here). Reading his blog, seems that there are people who don’t respect his copyrighted work either. then I will remove my warnings, including this post. If he doesn’t and I see similar in the future, he will get more visibility. Defamation is a serious matter. I wish I could continue my eGPU studies without googling “goalie”. One found today. It's funny he mentions Pike, who also suffers from people copy & pasting his work EXACTLY as Goalie did. I will find Pike's quote and link to it, pretty ironic really. Pike is pointing out that real hackers don't need to crib system mods and claim them as their own creation. 1. Goalie tried for months and months and failed each and every time to enable eGPU output on Nvidia cards. Oddly, he was convinced the key lay in the INtelAzul frame buffer kext, which of course had nothing to do with it. I had a good laugh whenever he posted about it. 2. Netkas and I found a VARIETY of ways to do this, and posted numerous screenshots, etc for a similar length of time. 3. Netkas put together an app and asked $20 to cover the hours invested. 4. Desperately jealous, Goalie PM'd a guy on TI called "Bryanshock" who was one of Netkas' first customers and who had reported success. Goalie BEGGED him to go poke around in the system folder and find what Netkas had changed. 5. Within hours of playing "Peek-a-boo" with Netkas' mods, Goalie reported an "AMAZING DISCOVERY" and actually encouraged people not to buy Netkas' app since he was going to hand it out for free like Candy at Christmas. No real hacker/modder would descend to this level of "borrowing". Enough said. So, I wrote Netstor and told them the truth about the Tech Charlatan. Great thing about telling the truth is you can never get sued for "libel" or "slander". I told them that Netkas and I could accomplish more breakthroughs if we had more gear and asked for some of their chassis to test with as demos. They told me they don't give out freebies, and that even goalie had to buy his. Then goalie posted a new round of blather. I wrote a GNU-EFI application that loops through GOP (Graphics Output Protocol) supported GPUs, and by selecting the index of the eGPU handle buffer, I was able to draw directly to that framebuffer with a R9 390 which supports UEFI GOP. It’s a couple of lines of C code, compiled under Ubuntu 15.10 and works like a charm in OS X EFI. Setting up the programming environment was easier with the GNU-EFI than EDK2. Have to keep in mind that interface calls must be passed on through uefi_call_wrapper() function. The proof of concept is done - I can access and draw anything I like on eGPU monitor at Mac EFI stage with a regular PC GPU, which supports GOP. My Nvidia cards did not seem to support GOP, but after a bit of googling I found that some Nvidia Asus cards have a hybrid vBIOS, including UEFI as well. 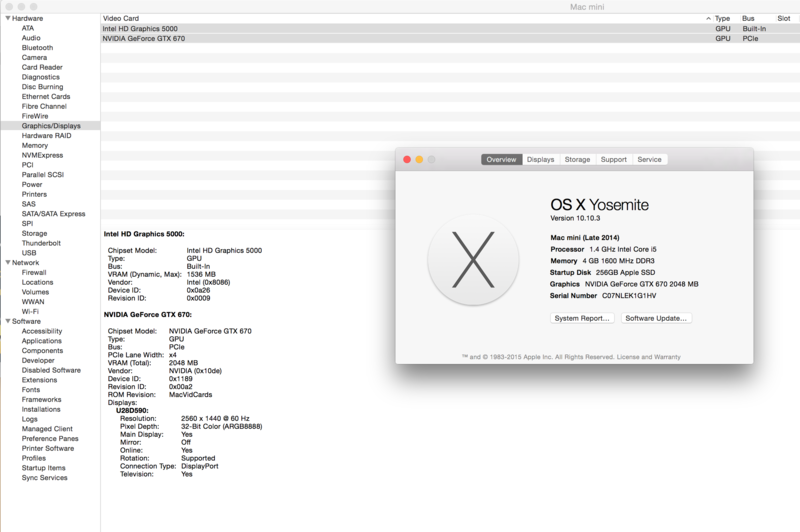 UEFI vBIOS also explains the squeezed resolution of Apple’s startup manager on MBP’s internal display. I’m investigating possibilities to swap internal and external framebuffers so that the eGPU monitor would become the main screen. Unfortunately there is no documented way to launch Apple’s startup manager programmatically in EFI environment, but if you have EFI programming skills, you can create something similar before the boot.efi & OS X will be loaded, or even replace the automate-eGPU script by an EFI app and menu-like UI, without installing rEFInd & EFI Shell. If I wanted to create pure C language version of the automate-eGPU, I would probably use FAT formatted USB stick where to load the EFI app. EFI approach would give full access to pre-OS hardware operations that are currently only partially controllable by NVRAM variables from my script. Currently I see no big benefits to move development on the EFI side, but I definitely consider UI app from the user space. "My Nvidia cards did not seem to support GOP, but after a bit of googling I found that some Nvidia Asus cards have a hybrid vBIOS, including UEFI as well." Wow, really? So someone trying REAL HARD to pass himself off as some sort of GPU guru has a complete and total LACK of actual working knowledge of how video cards work. EVERY VIDEO CARD BROUGHT OUT IN LAST 2-3 YEARS HAS A UEFI/GOP HYBRID BIOS. All of them. The 2011 era 7950 and 7970 introduced a dual position switch to allow PC users to have a UEFI BIOS and a straight PC BIOS choice. In early days of UEFI, some boards could use, some could not. I can tell you this, early Kepler cards had a placeholder, but by the time GK110 (780/Titan) came out, EACH AND EVERY NVIDIA CARD HAD A UEFI GOP ROM. Not just some oddball brand, not just some edge use case versions, but EACH AND EVERY CARD MADE BY EVERY MANUFACTURER. They still do. You can go to the TechPowerup GPU database, choose ANY Maxwell card, download the BIOS and look for yourself. (Will be the section starting around 65536, starts with "55AA") Yet the Rocket Scientist pretending to know things says his Nvidia cards don't have them. He is literally staring them in the face and has no idea what he is looking at, or talking about. Look at all those words he typed, pretending to explain something he is clearly incapable of understanding. Just needs a tweed jacket and Pipe to complete his "Professor" costume. Typed all those words trying to fool someone, maybe just himself. How can someone claim to be a GPU Guru when he is 3-5 years behind how they actually work? Edit: But I do appreciate being called a "Word Wizard". Maybe that will help me get an Agent?